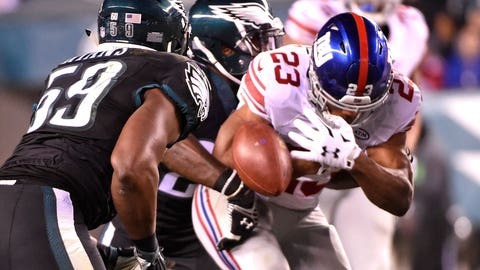 Rashad Jennings (23) loses a fumble in what turned out to be a defining play in the Giants' 27-7 Week 6 loss to the Eagles. With the New York Giants trailing by a touchdown in the second quarter, they were on the move and into the Philadelphia Eagles' side of the field when a careless mistake shifted the momentum of the game. Running back Rashad Jennings fumbled the football on a six-yard reception, and the Giants never regained their offensive flow in their 27-7 Week 6 loss. “It was a momentum swing,’’ Jennings said to reporters after the game, per the New York Post. “Didn’t hold onto the ball. We put our defense in a tough situation. Our defense played well and we kind of left them hanging. I feel I was a big part of us losing this game. Jennings wasn't the only Giant player to make a major mistake that led to points. Quarterback Eli Manning threw a careless pick-six, tight end Larry Donnell allowed a routine reception be ripped out of his hands for an interception, and the Giants had allowed two penalties to extend drives — the Eagles scored touchdowns on both of those extended drives. Jennings finished Week 6 as the Giants' most productive back with 83 yards on 16 total touches, but it wasn't enough to make up for his costly turnover. The Giants will need to do a much better job of protecting the football in Week 7 against an opportunistic Dallas Cowboys defense with an excellent pass rush.